Missing a tooth or teeth can be demoralizing and embarrassing. Fortunately, with modern technology it is possible to restore your smile and confidence with dental implants. Not only can dental implants replace missing teeth, they also help to maintain your jawbone in much the same way as your natural tooth roots. This leads to less bone loss and preserves a younger facial appearance. A natural tooth is anchored to the jawbone by its root. Tooth roots attach firmly to the jawbone through ligaments and keep your teeth stable and your bone levels healthy. Traditionally, if you replaced a missing tooth, the teeth on either side of the space would be cut down and crowned, and a fake tooth would be attached to, and supported by, those crowns. If the teeth adjacent to this space are healthy, Dr. Hendrix strongly recommends against this treatment option. He has a conservative approach to dentistry and attempts to maintain as much healthy tooth structure as possible. 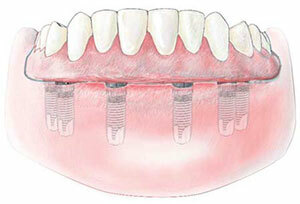 Dental implant treatment begins with an evaluation to determine if you are a good candidate for this procedure. 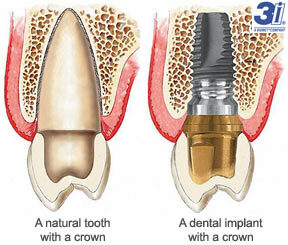 If you are interested in dental implants, please contact Dr. Hendrix for an evaluation.